The Personal Injury Group Attorneys of Morris James LLP understand that being injured in an accident can be a frightening experience, especially when someone else’s negligence caused your injuries. You may be facing medical bills, lost wages, and other significant expenses, all because of someone else’s carelessness. We frequently see victims who are injured because another driver was using a mobile device, disregards a red light or stop sign, is distracted by passengers, speeding, or is otherwise inattentive. 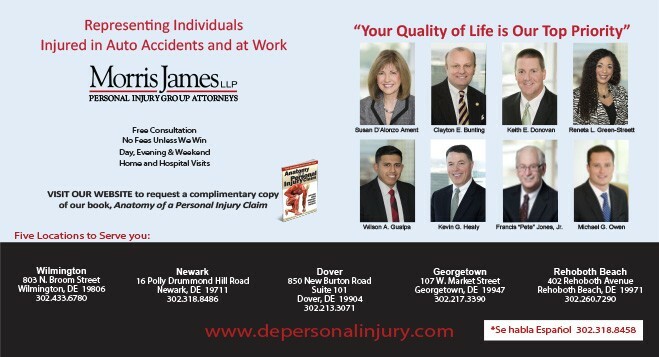 At the Delaware Personal Injury Group of Morris James LLP, our compassionate attorneys understand how difficult it can be to live with an injury. That is why we have dedicated ourselves to getting our clients the money they and their families need and deserve. If you have been injured in an accident, we will carefully review with you all insurance benefits to which you are entitled. Being injured in an accident can have wide-range repercussions. You may be unable to work and face medical bills you cannot afford. Any financial problems you may be facing could be magnified by the often significant costs associated with living with an injury. You and your family should not have to handle these responsibilities alone if someone else is responsible for your pain and suffering. If you or a loved one is injured due to another person’s negligent or reckless conduct, you need to know exactly what claims you can present to insurance companies under Delaware law. Do not let your rights be taken advantage of. Discussing your case with a dedicated Delaware personal injury attorney to become educated concerning your rights may be your first step towards securing justice and compensation. “You and your staff have always treated me with respect, kindness and have always helped steer me in the right direction and always told me to never give up.” – T.B. “My attorney was accommodating through my illness by coming to my home. Also, he and his staff always kept me updated.” – C. K.
“I found the group to be very friendly and involved. They settled the case in a timely manner and always consulted me before doing anything that involved my case. Also, everyone was up front and honest.” – J. H.